With our Varitune fully adjustable mufflers now in the hands of thousands of enthusiasts, it was only a matter of time before our engineers would start releasing our complete Varitune axle back exhaust system. The new BBK Varitune axle back exhaust kits offer true full tune ability with our patented adjustable power valve. 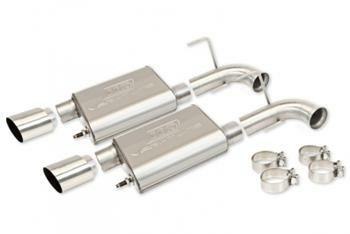 That’s right these systems come complete with two of our patented tunable Varitune performance mufflers engineered with the high flow direct fit tubing and hardware for a true bolt on installation. Also included with each system is a pair of our all new 4” polished high flow internal chamber exhaust tips for maximum looks and performance.